One of the things I love about my flat, despite in being a small one-bedroom, is that there is a good-size hallway and entrance inside. I love having this space to separate the public living areas with the private bedroom in the back. It’s very narrow, however, so a lot of things – like furniture – just won’t fit but since it’s the first thing when you come in something has got to be here. Currently there’s just three pieces of artwork hanging and one ginourmous floor to ceiling framed Pottery Barn mirror. It’s kind of generic, not-fun and definitely doesn’t reflect set the tone for coming into my home. 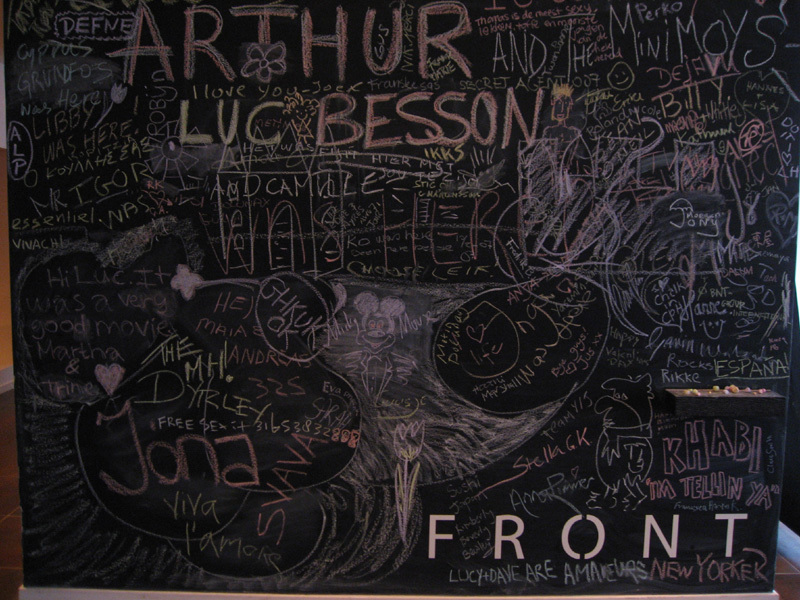 I’ve been wanting to use chalkboard paint on the wall ever since I it done at the amazing Front Hotel in Copenhagen (pictured above) where guests (including myself!) left notes and drawings. And then when I saw another great example but with magnetic primer, I was smitten with the idea. For one wall in my little entrance (where the arrows are pointing in the photos below), I am thinking of giving it a go. This way I can have an easy art-gallery by using magnets to hang up lots of art instead of expensive frames (no more leveling!) and friends can leave colourful notes and doodles. I think it’s a great art statement, fun and practical without being pretentious! Perfect! I am a little nervous about a huge black wall feeling over-powering or making the area really dark. I’m also concerned about finding a good magnetic primer or paint as it seems like a lot of them require 6 coats and even then have challenges with magnetizing (Rustoleoms is said to have very poor magnetization even after 6 coats) or primers having a rough texture. Other concerns include being able to easily paint it white before I move out since I’m a renter and easily cleaning the walls without chalkboard residue sticking, finding a good low VOC chalkboard paint (although I think Benjamin Moore’s Chalkboard Paint can be made low VOC). Apartment Therapy has a good thread on this where others talk about the same concerns but there doesn’t seem to be a lot of answers in there yet so it’s more Googling for me unless anyone has any ideas, suggestions or feedback (always appreciated!). Can you paint a big piece of plywood or partical board instead? And then mount that on the wall and trim it out with moulding? That way when/if you move on you can just take it down and the original wall will be underneath. Plus you can paint it outdoors where any fumes, low VOC or not, will dissapate a little quicker and at least not make your entire living space smell. That’s a great idea but unfortunately won’t work for me as the hall isn’t very wide and I need every inch I can get for the front door to open (as it is, it doesn’t open all the way now). I wish that’d work! Friends of us used a couple of layers magnetic paint on one of their kitchen walls. They covered it with the paint, which they used for the rest of their kitchen. The room remained very light. To make nice accents they bought some vintage picture frames and attached them on the magnetic part of the wall. Now all their friends know where they can leave their cards, messages etc. I like their idea very much. 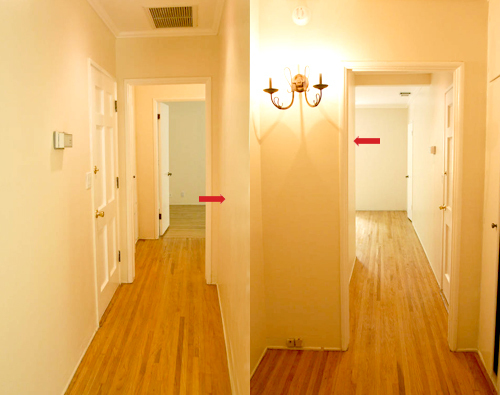 The frames probably won’t work for you since you stated that your hallway is very narrow. But having a magnetic white wall of stripe across your wall might work. I have two options: 1)re: color – there is also the neat green chalkboard paint like the old school days that you can get instead of black. Very pretty with your cream walls. 2). You can also cut some light weight sheet metal to the size you want and then paint over that. Plus you can frame it out with a cool recycled old frame or use light weight moldings to trim it out and attach to the wall. They come in so many unique options. in the past i have taken a rather large frame, traced the inside edge of it on the wall as a “template”. Painted with the chalk paint inside of the “template” and then hung the frame back up. So even though it is black and dark, the white frame gave it contrast. It might be an idea for you. Just use “sticky tak” to get the frame to stay stationary on the wall so when people write inside of the frame area, the frame won’t be in the way. If you are allowed to hang on the wall, you might also think to get a friend with a table saw to cut you out some simple flat wood to give the same effect as the frame and then tack it down around the edge of the painted area. It would be “flatter” than a frame so as not to take up too much of the hallway space. I love chalk paint and can’t wait to use it again! Good luck! I think dark walls look magnificant-especially in apartments that catch a lot of light. I hope you find that they show a lot of style, with something so simple! There is something so classic about it! Thanks for all your ideas, ladies! I think I’m going to go for it and incorporate some of the ideas here. I’m with Debbie on the sheet metal. As long as it’s thin enough you’ll have enough room for the chalkboard, and it might (?) help with the magnetism, and you can, most importantly, take it down if you decide you don’t like it or when you move. Here in Holland you can get chalkboard paint and mix it in any colour you like. What about removable vinyl wall decals? I know some companies have brought out large electromagnetic decals that are blackboards which can be written on. The beauty of this is you just peel it off when you leave. You could even contact a vinyl distributor directly and you can buy it by the metre. Good Luck. It’s such a fun idea. Someone sent me a link to this Etsy shop: Spell it Out Designs which has chalkboard decals for sale. Removable, too. While not a full wall, could be an interesting addition to another room. Stumbled across this simply by chance. Wasn’t even aware that such a thing as magnetized paint existed. Very cool indeed.